Coming Apart at the Seams starts off fast, furious, and red-hot, then turns into something much more. Jenna Sutton’s second Riley O’Brien & Co. book is an excellent blend of sweetness, hope, heartbreak, sensuality, and second chances. Teagan O’Brien is smart, confident, and can’t be rattled – except by Nick Priest. Nick has always been her brothers’ friend, but a few years ago Teagan and Nick became friends in their own right. Then – for a brief moment – they became something more before everything came crashing down around them, shattering Teagan’s heart. Since then Teagan has studiously avoided Nick, which wasn’t hard to do until he decided to retire from football and take a job at her family’s company. Nick is determined to win Teagan back, but he has his work cut out for him, because she can’t forget their past and won’t give him the time of day, no matter how fierce the attraction between them still is. Coming Apart at the Seams is set up in an interesting manner. It starts off in the present, then steps back into Teagan and Nick’s past where we spend about half the story. I do wish we had spent a bit more time in the present, as it would have made the resolution after all the push-pull moments more satisfying. But overall the story had a nice pace, going from the breathtaking rush of the beginning to the innocent beginning of Nick and Teagan’s friendship. I absolutely adore a good friends-to-lovers story and when we’re in the past, Teagan and Nick’s is a great one. The two of them are both bright and likeable, and it was nice seeing their bond develop and deepen, even knowing it had to crash and burn before we return to the present (or we wouldn’t have a story). Their romance was organic and the banter, sexual tension, and truly sweet moments between Nick and Teagan made them a couple to root for. What makes Coming Apart at the Seams work is the personalities and chemistry of Teagan and Nick. Teagan is bright and eager when we see her in grad school and she gets under Nick’s skin before he even realizes it. Nick is a stunningly gorgeous football player, but he has a secret: a severe stutter he’ll do anything to hide. Nick didn’t grow up in a supportive environment – quite the opposite in fact – and Ms. Sutton does a stellar job of showing the emotional and psychological toll Nick’s stutter takes on him. Nick’s pain and frustration is palpable and when things go south with Teagan my heart broke for them both. That being said, one of the things that kept this story from being a perfect read is that I did sometimes want to shake Teagan for her obliviousness and Nick for his unwillingness to open up and go after her. 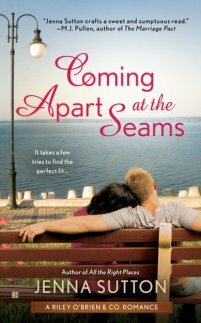 Coming Apart at the Seams is the second book in the Riley O’Brien & Co. series and since I haven’t read the first book, I can safely say Teagan and Nick’s story can be read as a standalone. If you don’t like spoilers and haven’t read All the Right Places, fair warning that there are some mild spoilers for Amelia and Quinn’s book. The O’Brien family is utterly delightful and I was so entertained by Coming Apart at the Seams that I will be picking up All the Right Places as soon as possible and will definitely be grabbing the next Riley O’Brien & Co. book, Hanging by a Thread, as soon as it comes out.